If there’s mold within your home, you probably know about it. You’ll probably notice discoloration on walls, floors, or ceilings, a musty odor, or worsening allergies or asthma. Additionally, if you have an allergy that occurs over several seasons, you probably have a mold allergy. At Boerne Air Conditioning Experts, we’ve learned that mold lives everywhere; outdoor molds can cause allergy symptoms in the summer and fall. Indoor molds can cause allergy symptoms year round. If you have a mold or bacteria issue in your home, what can you do to address it? Luckily, there are many ways to fight the mold allergies in your home if your mold problem is not overwhelming. Indoor molds grow in areas in your home where there may be extra dampness. To prevent mold and mildew in your home, you need to remove sources of water or dampness. Mold and bacteria can usually be cleaned away by wiping them down with a dilute solution of bleach. But if the conditions are right for mold growth, the growth will most likely recur. Mold spores are naturally present in the air around us, so avoiding them entirely is impractical. However, the quantities naturally present in air typically don’t present a health concern, while the quantities released by a mold infestation can. Mold, bacteria, and other unwanted growths such as fungal colonies and mildew all require dampness in order to grow. Plumbing leaks, condensation that never evaporates, and standing water inside your home all contribute to a mold-friendly environment. If you have leaks in your plumbing, have a plumber come to inspect things. If the problem is a larger humidity problem, you may want to consider whole-house dehumidifiers or ventilation options. When the problem is localized to a certain room, such as a kitchen or bathroom, a standalone dehumidifier or fan may suffice. 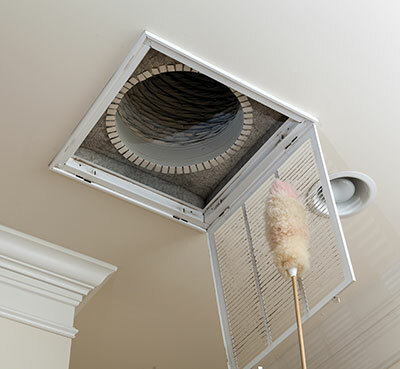 Exhaust fans remove moist air from your home and vent it outside. If you do not have an exhaust fan, open the window to let moist air out when you shower or cook. As we briefly mentioned, using a dehumidifier can also help to remove moisture and keep the humidity in your house below 45 percent. You should drain the dehumidifier regularly and clean the condensation soils and collection bucket. Your air conditioning can also be helpful to trap mold spore from your entire home. You may also want to consider air filtration or cleaning, though you should be aware that if you have larger humidity problems, mold can begin to grow directly in the damp filter medium. One way to prevent this is with the addition of UV lights to your indoor air quality solution, possibly even next to your filter media. UV lights kill off mold spores, bacteria, fungal spores, and mildew, meaning that even if they remain in your air supply, they can’t colonize your home. Another step you can take to fight your mold allergies and prevent mold growth in general is to ensure that water drains away from your home. Rainwater should drain away from your home, and it’s important to make sure your gutters are not full. The ground around your home should slope slightly down and away from your home. Be sure to remove dead leaves and vegetation near your home's foundation as well. To combat your mold allergies, vacuum regularly to remove organic sources of mold growth. Dust is a great substrate for mold growth, and learning how to use a vacuum effectively should be one of your main priorities. Remember that one of the three requirements for mold to thrive is an organic substrate. Consider this, how would your garden look if you removed all of the soil? It seems obvious with the garden example, but on a microscopic level it is also true. Vacuuming regularly removes dust, pollen and other organic compounds from the carpet. It also disturbs what it doesn’t pick up into the air column where your air conditioner can quickly filter it out. Along those same lines, you should ensure that your attic has enough fans to minimize mold growth. Attic fans can be electrical or wind powered, but don’t get too wrapped around the axel on this because either one will do. Your attic isn’t air conditioned like your house is, so it’s important to keep it well ventilated to reduce the amount of mold that can grow and spread into your home. For more tips for fighting mold allergies in your home, reach out to one of our staff members at Boerne Air Conditioning Experts.